The Peace Corps Prep Program is a formal cooperative agreement between Elon University and the Peace Corps. The Peace Corps and Elon University are a natural “fit”. Elon’s values of global citizenship, experiential learning, study abroad, service and academic rigor are in line with Peace Corps values. 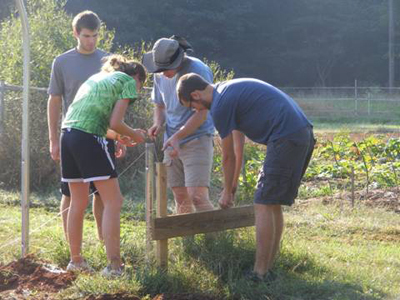 The Elon program is housed in the Environmental Studies Department and focuses on preparing students with skills in sustainable agriculture, responsible architecture and environmental management. This provides each student with a basic skill set the Peace Corps and its participatory countries need for successful community projects. This preparation also helps each participant maximize their Peace Corps service and personal experiences. While the program does not guarantee acceptance into Peace Corps, students participating in the program will gain skills which are an advantage in the competitive Peace Corps application process and in other international development work. Read more about the partnership here.